← It’s Curtains for Us! The closet opening is all framed in and trimmed. 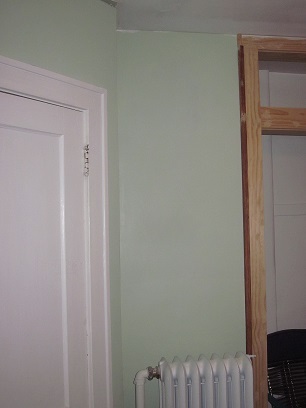 The nail holes have been filled, but need to be sanded, then it’s priming/painting time. Hey, also? 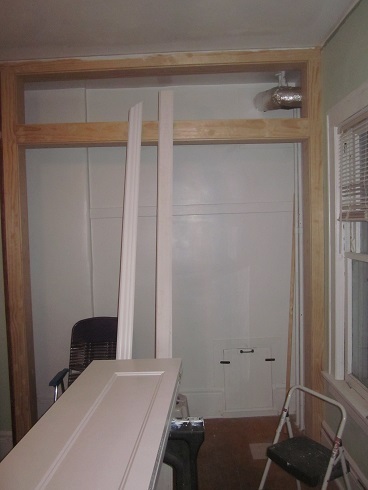 I just remembered that the shelf between the closet and the cabinets is in! You can see the underside in the picture above (primed, but still needs painting). And the floor has been patched. I think the lawn chair is a good addition! We are halfway through deciding whether to proceed with floor refinishing now or later. We had been going to do just this room for now, but it probably makes more sense to do both bedrooms and the hallway in one fell swoop. After reading about the fun they are having with floor sanding at Little House on the Corner, I’m thinking maybe that job could wait. 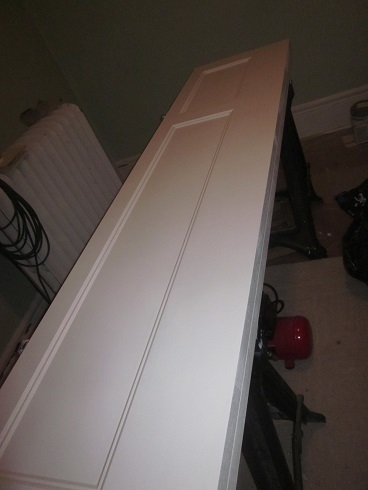 The doors are almost completely painted — just one more coat with the foam roller. 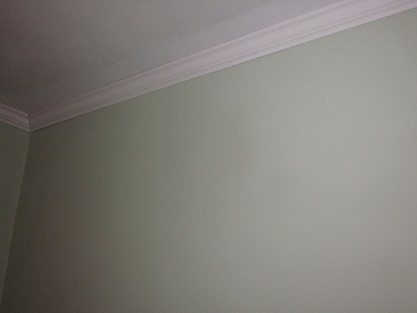 I finished patching and priming the walls and the first coat of Benjamin Moore Hollingsworth Green is up! I also finished patching most of the ceiling (leaving the middle so I can patch the HUGE HOLE that will be left when we move the light fixture at the same time), and I primed and painted around the outer edge … to facilitate moulding installation. 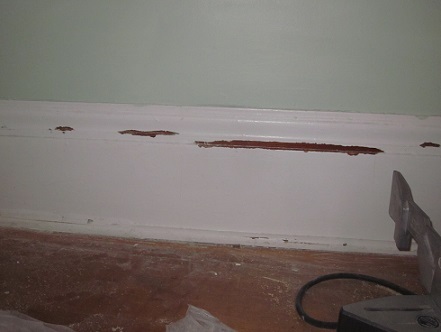 I’ve also scraped the bad bits of paint on the base/skirting boards, so next is cleaning that up and priming. And painting. 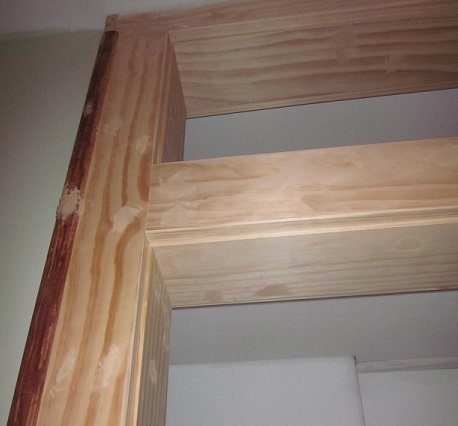 I was thinking that I would also pop out our original windows and restore them. You know, just pop them out and completely restore them, as you do. No biggie! Like the floor, that might end up waiting. They’re still going to be there later. I mentioned the bed is pretty much done, and I’ve started installing the drawer glides. I’m also updating a vanity table and making a floating bedside table. I bought curtain fabric, as well as black-out lining for Roman shades — just gotta make those now. I’m restoring an old ceiling fixture, which will either be for this room or another, but either way, we need to move the box for the ceiling light, so hopefully we’ll get on that this week. I was going to add a couple of new sockets to the room, but as with the floor refinishing and the windows, that might have to wait until later. Can’t have all the fun at once! This entry was posted in Construction, Decor, Walls & Floors, Windows & Doors and tagged bedroom remodel. Bookmark the permalink. I’m not sure that “fun” is a word I’d use in connection with sanding the floor! 😉 It’s definitely something you could do yourself though! I know it’s a huge pain to do 3 rooms at once, but it’ll mean you only have to pay to hire the sander once and not 3 times. Oh, just as a tip, you’re meant to finish all decorating first – we were just too impatient! 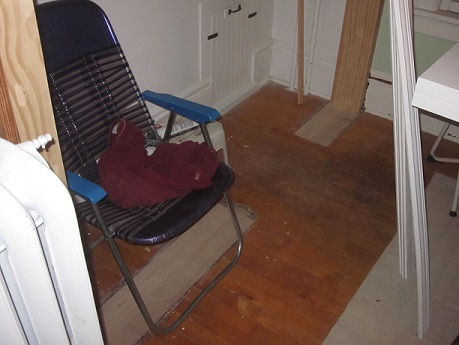 Christine, thanks for the insights — you’ve helped us make the decision to wait on the floors! Three spaces at once will be much more efficient, and I don’t want to haul the sander back and forth to the shop more often than we have to. (Plus, I just want to be sleeping in my own room again.) Your floors look terrific, by the way!